OK, I got some comments when I wore this that my sweater is too tiny, but that's just from people who don't get the whole "shrunken" look deal or the current "cropped sweater over longer shirt" trend, right? Regardless, too small or not, this sweater makes me irrationally happy every time I wear it, so I am just going to keep on keeping on. What piece from your closet just puts you into an instant better mood when you wear it? That sounds like something my bf would say, "why is your jacket so short?!? I don't get it." It's super cute. Nothing like a pop of colour to make you happy. Um.....WAT? I could understand the comments if the sweater looked made you look like a busted can of biscuits because it was too tight but this looks intentionally cropped so you don't. I'm glad you didn't let anyone saying anything get you down, that sweater is gorgeous on you! Oh goodness, "busted can of biscuits"! I want to use that but I probably shouldn't, hehe! Super adorable as usual - it's clear you feel happy and confident in this outfit. As opposed to me and my OOTD today. Sigh...The things I do for themes and linkups. This is more or less my happy outfit. 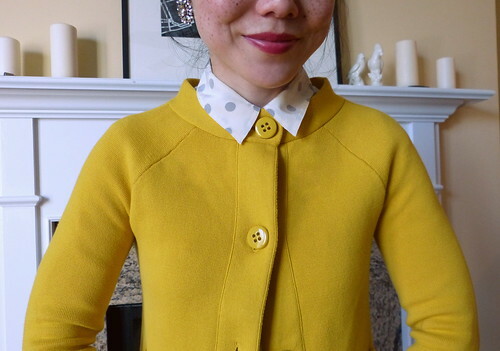 I have a Boden polka dot shirt which I love wearing with a mustard cardigan/coat every time I need a mood boost. Yellow never fails to lift my spirit. This is so cute. I love the colour. This is such a lovely sweater! I love the color! I would say I have a button shirt with birds on it that makes me instantly happy when I wear it. The people making those comments clearly aren't into fashion! The color is so fun and cheerful! Eh, they don't know what they're talking about! I had a cropped sweater a long time ago that got the same comments ("where did you get that--Baby Gap?") and I got rid of it and always regretted it. I love this bright sunny piece! It looks great with the polka dots! I got rid of a shrunken navy blazer way back when because one friend made a "teeny tiny jacket" comment and then everyone else followed suit. I still regret it! Oh my goodness, this is such a fun outfit! Love the yellow with grey polka dots. Thank you, thank you, thank you! I have a gorgeous, cashmere cropped sweater that is one of the favorite things in my closet (despite the fact that I can't figure out how to wear it). Until now! I am so excited for the inspiration. I'm going to wear it today. And maybe tomorrow ;) Love your pairing. It's perfect! The little collar buttoned up is so cute. I wear this cardi a ton myself - hey, if we love it and it works, why not? Don't get rid of that yellow sweater. That color is absolutely gorgeous on you. You look great in yellow Lisa. I think my uplifting color is red. That blouse is a must have in any closet! I wear mine all the time. PS - I loved your 20 facts that you shared on instagram! Love thee mix of yellow and blue, you look lovely. What a lovely look! I love this trend. Let's not forget that lovely bag as well. Great look! It definitely looks on trend. Some people just don't get trends, like the boyfriend trend, the shrunken trend, etc. My Mother thinks everything should fit perfectly. She doesn't get playing around with different silhouettes, I think the color is perfect on you and the shoes are gorgeous. I love slouchy stuff - which in the eyes of my parents, means I'm sloppy! Yellow makes me happy too! I am always happy in my yellow tops - especially the mustard hued ones. Yeah, Jenna Lyons totally does not dress for men, haha. I love yellow, especially this shade! It's such a happy color. You look great! This outfit reminds me of something my older (stylish!) sister would wear! She loves the gray and yellow combination and always seems to be wearing it or putting it into her home decor. My happy item right now is probably my coral blazer. I just love all shades of pink these days! Grey and yellow is such a pretty combo to me! That sweater makes me happy too! Wearing pink always makes me happy. And polka dots. Together...whoa, watch out world! The sweater is adorable! It has a cute vintage and retro feel to it. I think anything in a bright color or a quirky print (cute animals) makes me very happy! I really like the color of the jacket! Do you find it's hard to style? Yes and no. No because when it's unbuttoned, I can wear it in place of a jacket. Yes because there are certain silhouettes it works with, like with the longer lean shirt underneath or maybe with some high-waisted bottoms. 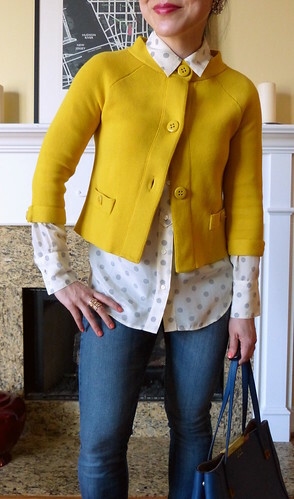 The jacket is such a great color, I love it with dots! I have a similar top. Never though to wear it with yellow... thanks girl! This outfit is so cute, I love the layering you've got on. And that sunny yellow is too awesome, I actually find myself wearing that colour if I want to cheer myself up - today only in the form of dainty little earrings and a massive tacky plastic watch, but that yellow is just so energising! You are so right to ignore those ignorants. This look and especially this cardigan is so nice. A very good purchase. And styled in your usual good way. Such a wonderful happy look! And I have to admit that I want immediately your jacket which you combined in such a tasteful and inspiring way <3 Thanks for that! I think that cardigan is very stylish and would love it in a hot pink. I like that you have paired it with a long blouse. Those are nice Vince Camuto shoes too. Are they comfortable on? I have found that every time I'm dressed in Anthropologie clothing, I feel stylish, which leads to sheer comfort. The shoes are all leather, so they stretch out a bit fit my feet. But the tottering heels don't necessarily make them the most comfy shoes, hehe! Anything pink puts me in the mood usually, but this year it has been the Floral Embossed Sweater from J Crew in navy. I just love it! 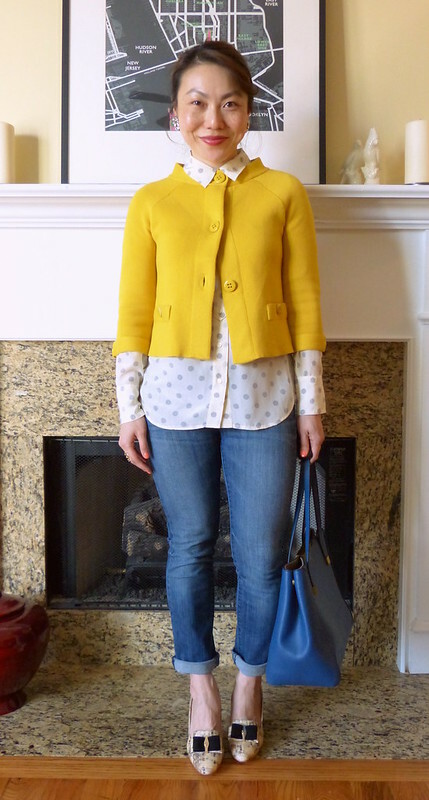 i love this yellow blazer and the shrunken style actually fits you perfectly! great way to layer it over a longer top! I just purchased an orange jacket almost exactly like this for $1 at a local used clothing store. I was unsure about it, but you are inspiring me to wear it! I love this look on you. The yellow is great! Usually a great fitting dress does the magic for me. Love this combo! That sweater is so cute, and I love the blouse under.